Logic Path: Home Page >> Attraction >> il "Bargello"
The most famous stone palace of the city was built on commission (1255) by the Faction of the People as a fortress and arsenal to resist the nobles of the city; later on it became the seat of the Captains of the People (Podestà) who guided the Faction. 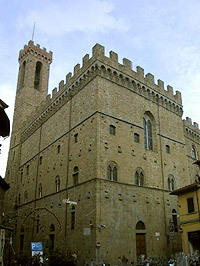 Through time, the structure was used for other functions: from 1574, in fact, it was entrusted to the Captain of Justice or Bargello (from which the present name of the museum derives) which was transformed it into a jail. It was born as a museum in 1865. The entrance, from the angled tower on via del Proconsolo, leads you into the Medieval Courtyard, the first corner which arouses a suggestive artistic and architectural interest. On the wall that leads to the first floor one can notice the coat-of-arms of the Podestà which followed each other through the years at the head of the Faction of the People. In the centre, presently containing a well, there was once the gallows. 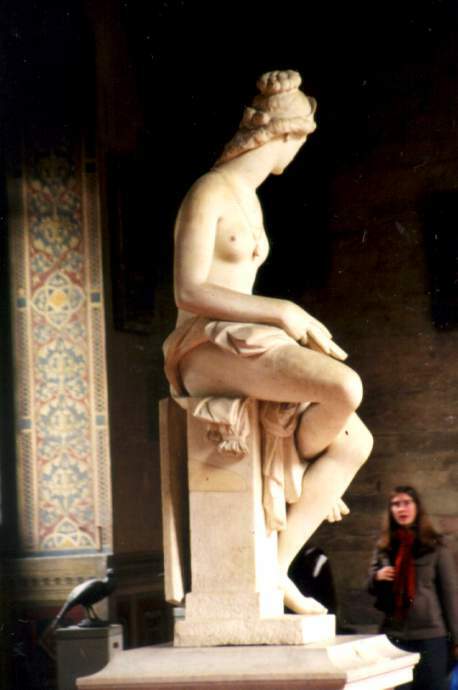 From the courtyard you enter to the first room dedicated to the works of the Florence maestros such as the Tondo Pitti or the Bacco by Michelangelo or the Mercurio and la Firenze vittoriosa su Pisa by Gianbologna. After the wonderful sculptures of this first room, you proceed to the first floor from the stairway of the courtyard. The first room is the Room of the Ivories (la Sala degli Avori), which contains the ivory pieces of the Carrand collection: 265 pieces dated between the 5th and the 17th centuries, among which there are sacred and pagan themed diptychs, panels, caskets and wings. 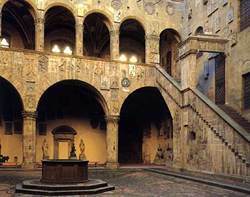 You then continue to the second room, the real Treasure of the Bargello (Forziere of the Bargello): a collection of precious treated works, which belong to the Carrand collection. On the right side there is the entrance to the Chapel of Maria Maddalena and the Sacristy, a room which was reserved to the condemned waiting for their execution. The frescos of the school of Giotto are of great value and enrich the room. From the Treasure (Forziere) of the Carrand collection you enter the Islamic Room (la Sala Islamica) which contains a collection of oriental carpets and objects. The next room is the Room of the Council (la sala del Consiglio): the heart of the administration activities of the city for about forty years after the Council of the Republic of Florence took its place (Consiglio della Repubblica di Firenze), today it contains the sculptures of the artists who lived in the 15th century Florence. Following along we find the Room of the Majolica's (la Sala delle Maioliche) which, from 1888, contains exemplars of the workshops of Urbino, Siena, Orvieto and Firenze. On the second floor, the first room is dedicated to Giovanni della Robbia: it contains terracotta sculptures and a collection of medals donated by the Dukes of Florence. You then proceed to the Room of the Arms (la Sala delle Armi), a rich collection of weapons for attacks and defences of Medieval origin. Followed by the Room named after Andrea della Robbia, the Room of the Small Bronzes (la Sala dei Bronzetti), the Room of Verrocchio (la Sala del Verrocchio) and, at last, but not least precious the very famous Room of Medals of Florence (Medagliere di Firenze), a rich collection of medals, which in the Renaissance age were commemorative medals of buildings, events and personalities of the Renaissance years. The history of the city and of the age, well narrated and expressed through the works of the Museo del Bargello draws the visitor towards an overview of the Renaissance which made Florence become one of the capitals of art.